How the reversing gears works ? : The diesel engine is a type of internal combustion engine which ignites the fuel by injecting it into hot, high-pressure air in a combustion chamber. In common with all internal combustion engines the diesel engine operates with a fixed sequence of events, which may be achieved either in four strokes or two, a stroke being the travel of the piston between its extreme points. Each stroke is accomplished in half a revolution of the crankshaft. The gearing arrangement used to reduce the medium-speed engine drive down to suitable propeller revolutions . Where a gearbox is used with a diesel engine, reversing gears may be incorporated so that the engine itself is not reversed. Where a controllable pitch propeller is in use there is no requirement to reverse the main engine. However, when it is necessary to run the engine in reverse it must be started in reverse and the fuel injection timing must be changed. Where exhaust timing or poppet valves are used they also must be retimed. With jerk-type fuel pumps the fuel cams on the camshaft must be repositioned. This can be done by having a separate reversing cam and moving the camshaft axially to bring it into position. Alternatively a lost-motion clutch may be used in conjunction with the ahead pump-timing cam. The fuel pump cam and lost-motion clutch arrangement is shown in Figure . The shaping of the cam results in a period of pumping first then about 10° of fuel injection before top dead centre and about 5° after top dead centre. A period of dwell then occurs when the fuel pump plunger does not move. A fully reversible cam will be symmetrical about this point, as shown. The angular period between the top dead centre points for ahead and astern running will be the 'lost motion' required for astern running. The lost-motion clutch or servo motor uses a rotating vane which is attached to the camshaft but can move in relation to the camshaft drive from the crankshaft. The vane is shown held in the ahead operating position by oil pressure. 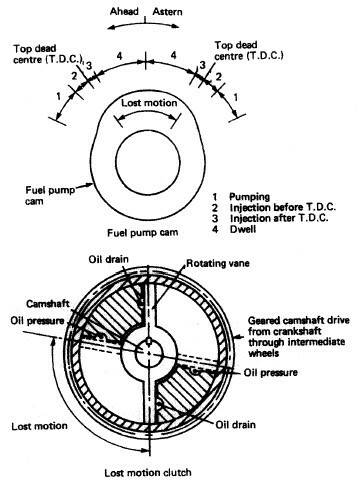 When oil is supplied under pressure through the drain, the vane will rotate through the lost-motion angular distance to change the fuel timing for astern operation. The starting air system is retimed, either by this camshaft movement or by a directional air supply being admitted to the starting air distributor, to reposition the cams. Exhaust timing or poppet valves will have their own lost-motion clutch or servo motor for astern timing.